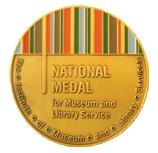 In a White House Ceremony on May 8, First Lady Michelle Obama will join Director Susan Hildreth and the Institute of Museum and Library Services to present the 2013 National Medal for Museum and Library Service. Ten institutions from across the country will be honored. In addition to the museum and library leaders, a member from each recognized community will participate in the ceremony to highlight how the museum or library has affected their lives. Boston Children's Museum, Boston, Mass. Discovery Science Center, Santa Ana, Calif.
Pierce County Library System, Tacoma, Wash.
Rancho Cucamonga Public Library, Rancho Cucamonga, Calif.
Waukegan Public Library, Waukegan, Ill. WHEN: Wednesday, May 8, 1:30 p.m.
CREDENTIALING: Any reporter interested in covering this event must contact Sara Neumann at (202) 414-0788 or sneumann@susandavis.com by Monday, May 6 at 1 p.m. EDT to initiate the credentialing process. MEDIA NOTE: To coordinate advance or on-site interviews with IMLS Director Susan Hildreth or 2013 National Medal for Museum and Library Service recipients and community members, please contact Sara Neumann at (202) 414-0788 or sneumann@susandavis.com.